Tomokui Kanata has suffered an early death, but his adventures are far from over. He is reborn into a fantastical world of monsters and magic - but as a lowly goblin! Not about to let that stop him, the now renamed Rou uses his new physical prowess and his old memories to plow ahead in a world where consuming other creatures allows him to acquire their powers. Based on a popular novel series, Re:Monster is the newest tale of reincarnation and survival in another world. When a young man begins life anew as a lowly goblin, he forges past all obstacles with a combination of strength, smarts, and a monstrous appetite! 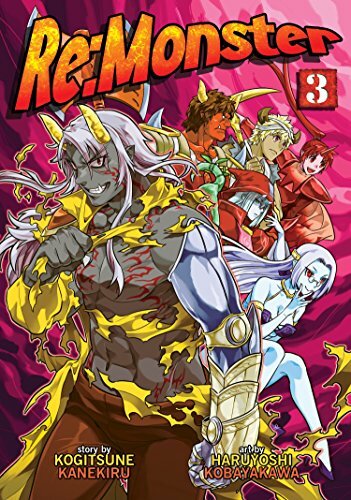 The series' detailed species information, powerful shonen-style artwork, and fast-paced action scenes will appeal to fans of such fantasy series as Overlord and Sword Art Online! Seven Seas will release Re:Monster as single volumes with at least two full-colour illustrations in each book. Tomokui Kanata has suffered an early death, but his adventures are far from over. He is reborn into a fantastical world of monsters and magic - but as a lowly goblin! Not about to let that stop him, the now renamed Rou uses his new physical prowess and his old memories to plow ahead in a world where consuming other creatures allows him to acquire their powers. Kanekiru Kogitsune is a Japanese author best known as the creator of the Re: Monster series of light novels and manga. Kobayakawa Haruyoshi is a manga artist best known for his work on Re: Monster and a manga adaptation of the video game, BlazBlue.